Siak Regency Council (DPRD), Riau, visits Jakarta DPRD to do comparative study.
" We want to learn about food security regulation in Jakarta"
Siak DPRD Member, Toha Nasruti said, his side wants to learn about food security regulation in Jakarta since his region doesn't have it. "We want to learn about food security regulation in Jakarta. Currently, we are still preparing regional regulation (perda) related to food security," he explained, Thursday (2/7). 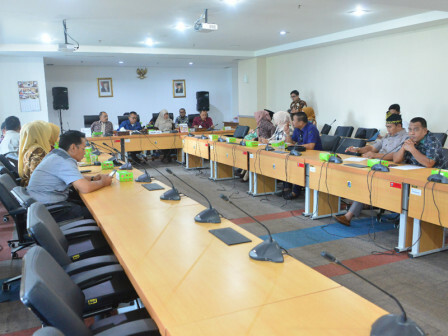 Jakarta DPRD Vice Chairman, Mohammad Taufik stated, Jakarta has Regional Inflation Control Team (TPID) that consists of Regional-Owned Enterprises (BUMD)s in food field such as PT. Food Station Tjipinang Jaya, Perumda Pasar Jaya, and PD. Dharma Jaya; Economic Bureau; Maritime Agriculture and Food Security (KPKP) Department; and Bank Indonesia's Jakarta Branch. "Those components are needed to fulfill residents' needs and control the price," he conveyed.